Review of How to Stop Worrying and Start Living by Dale Carnegie. In 1913 Dale Carnegie began teaching a course at a YMCA in New York City on how to help men communicate more effectively. Carnegie wrote about many of these techniques in his well known book, How To Win Friends and Influence People. 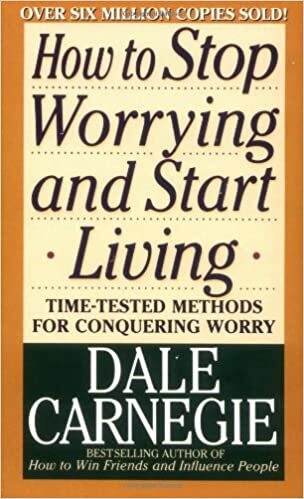 Another book Carnegie wrote is How to Stop Worrying and Start Living: Time-tested methods for conquering worry. I first learned about this book when I participated in the Dale Carnegie Course on Effective Communications and Human Relations, a twelve-class series on improving communication techniques, working more effectively with others, and making better life decisions. One of the best chapters is, "A Magic Formula for Solving Worry Situations." Ask yourself, "What is the worst that can possibly happen?" I have used this three-step formula on multiple occasions to prepare myself for a situations with a potentially negative outcome. At the time I took this class, I was dealing with some problems at work, and accepting the worst brought me some peace in the situation. Find yourself and be yourself—remember there is no one else on earth like you! This is an excellent book, and one you should add to your library. It is available in print for as little as $0.01 (that's 1 cent) from Amazon used books.